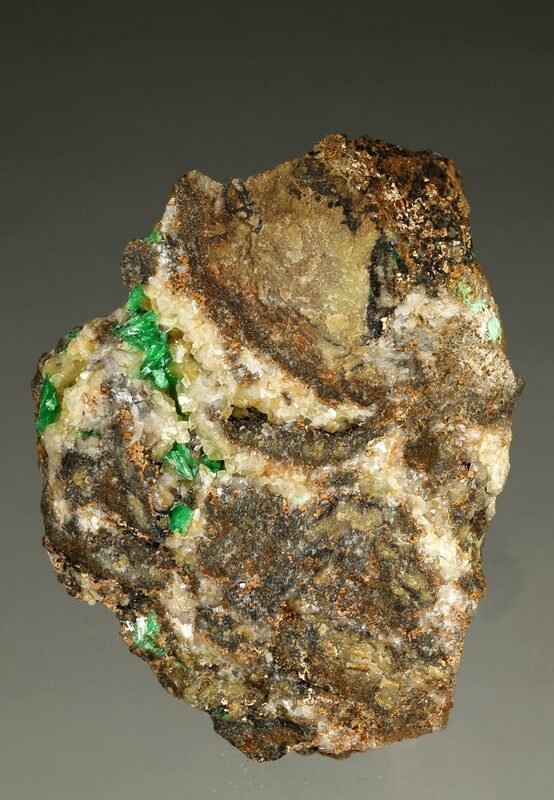 Interesting and old specimen of annabergite showing bright green flattened prismatic crystals with transparence. 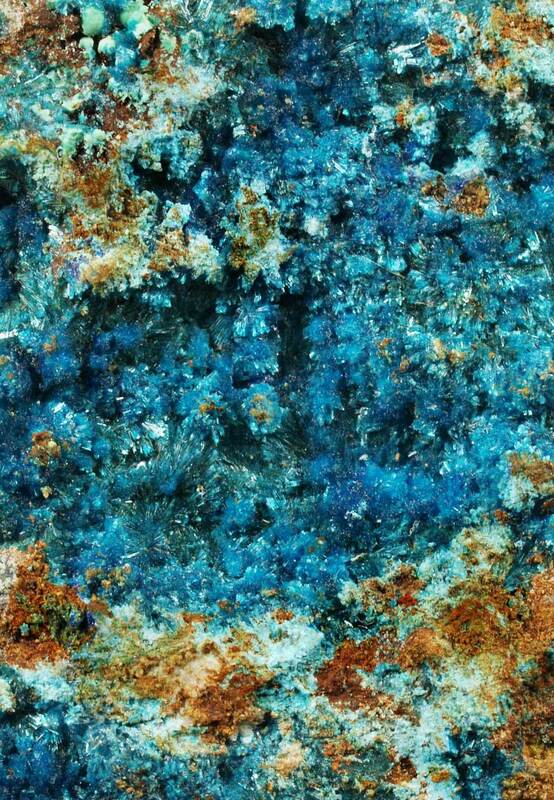 They are disposed in cavities of the dolomitic matrix. 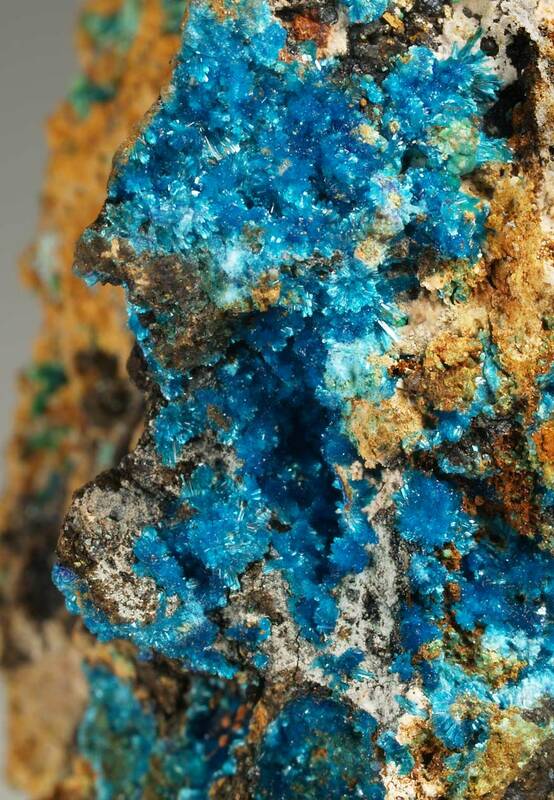 From Laurion, an European classic locality. 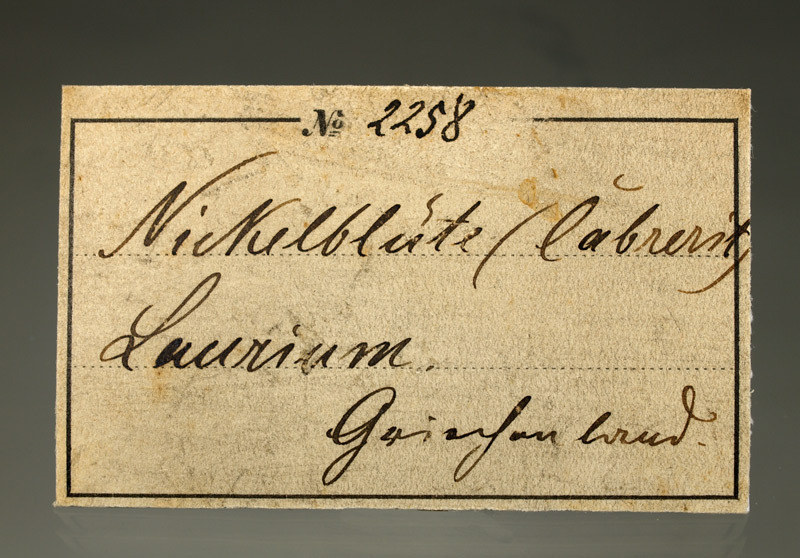 The specimen is accompanied by an old label from XIX century from an unknown German collection (till today). Size: 5,8 x 4,7 x 3,3 cm. 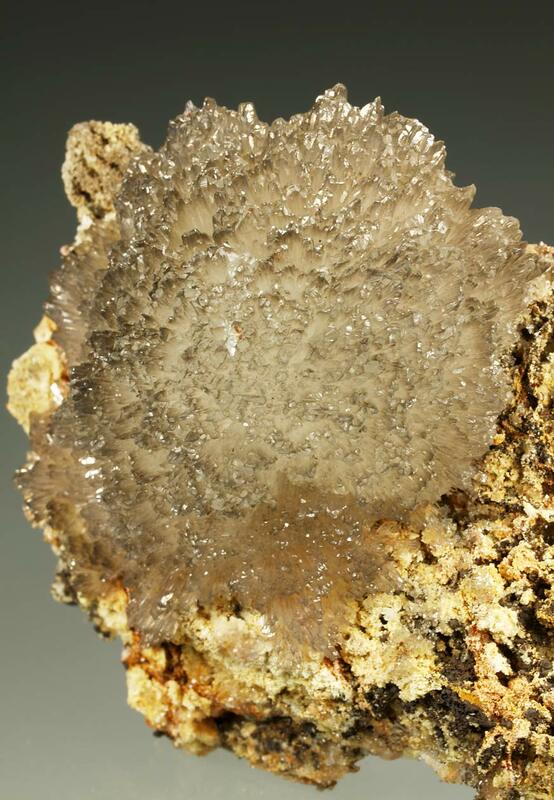 Rich group of aragonite crystals forming an aesthetic and shiny rosette. 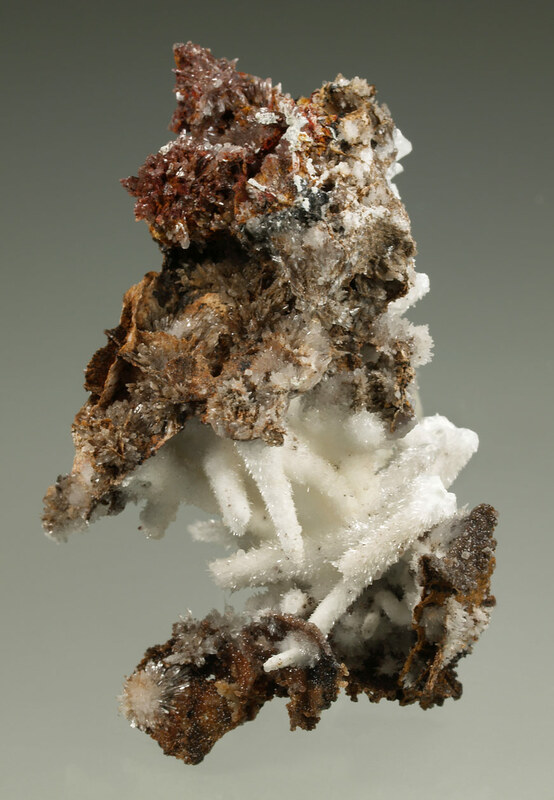 A specimen of great aesthetic, unusual for this mine and in collections. A classic Greek locality. 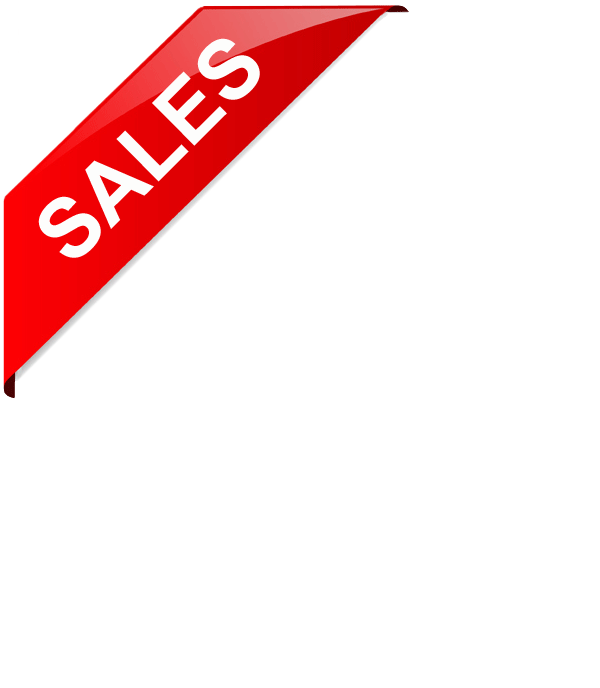 From a former collection, which label will be send to the buyer. Size: 9.2 x 7.0 x 4.3 cm. 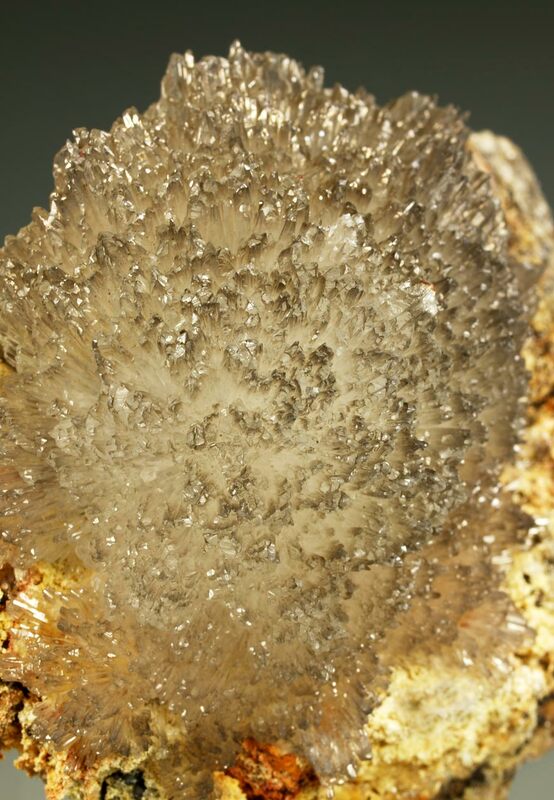 Main crystal: 52 x 47 mm. ros. 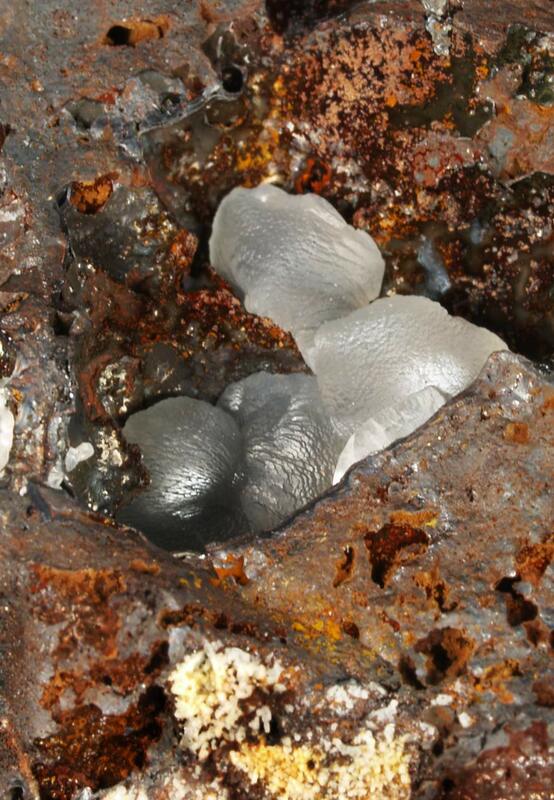 The specimen is very rich in fan-shapped aggregates of lath-like serpierite crystals. 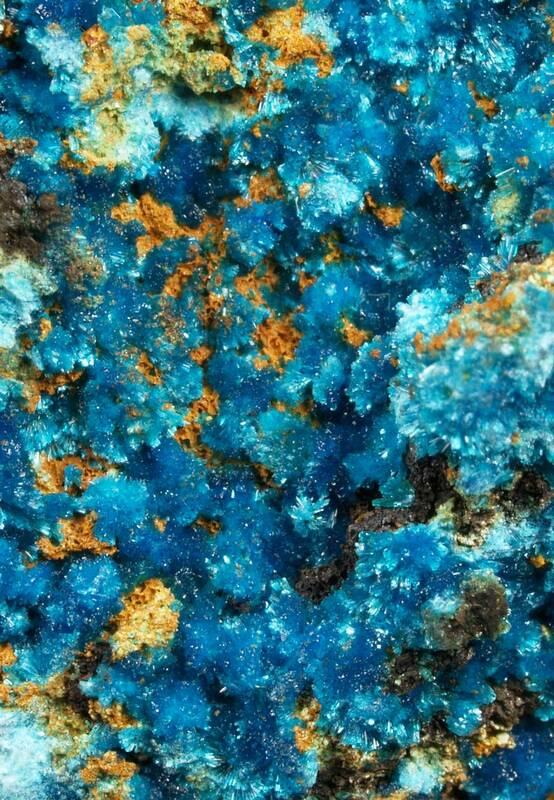 They show an intense sky blue color, good transparence and exceptional brightness. 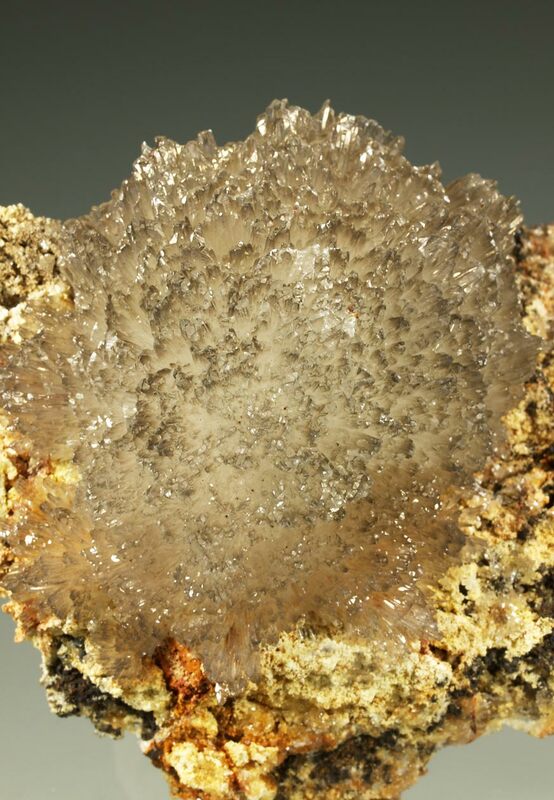 Serpierite crystals are covering cavities of the limonitic matrix. Their quality is excellent and under magnifying glass their beauty and aesthetics are superb. 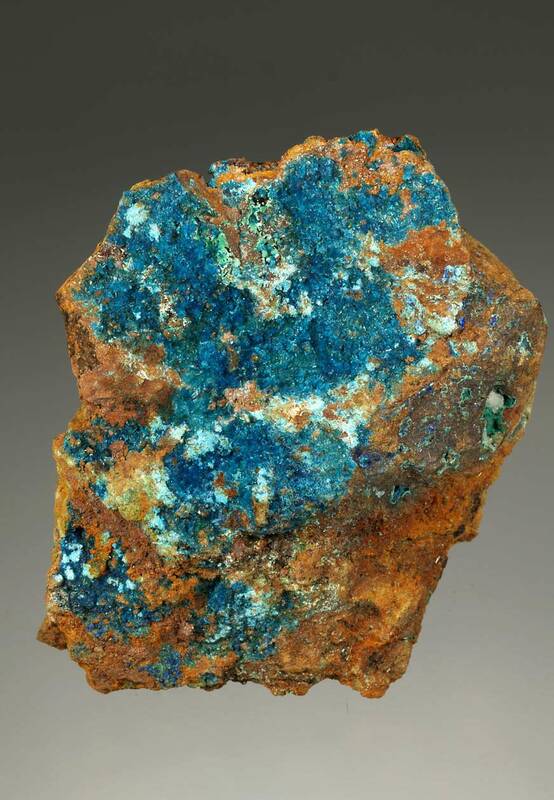 Accompanied by spherical aggregates of malachite and some crusts of azurite. A specimen with good size and quality for the species. Size: 5.2 x 4.0 x 3.7 cm. 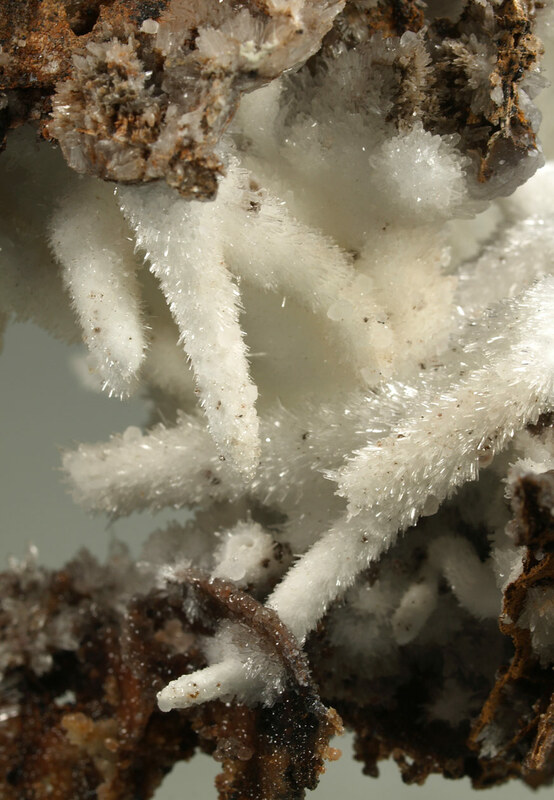 Main crystal: 1.5 x 1 mm. 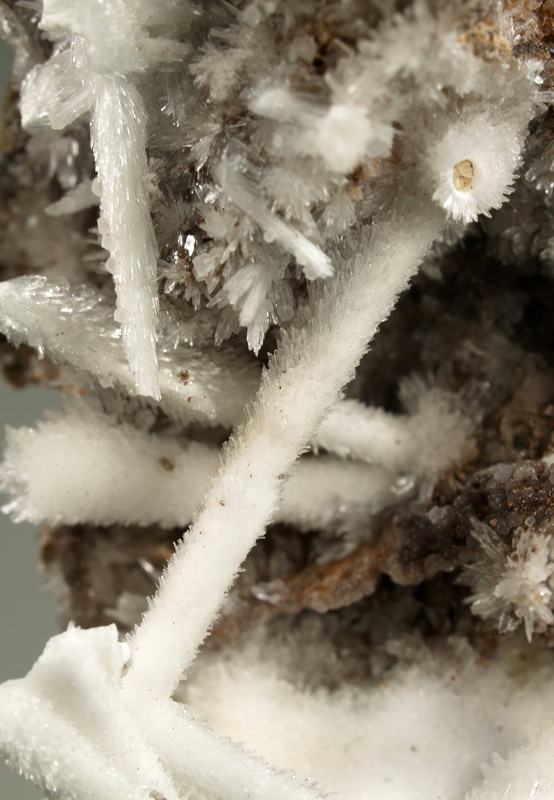 A rich specimen of serpierite showing fan-shapped aggregates of lath-like crystals. They show an intense sky blue color, good transparence and brightness. 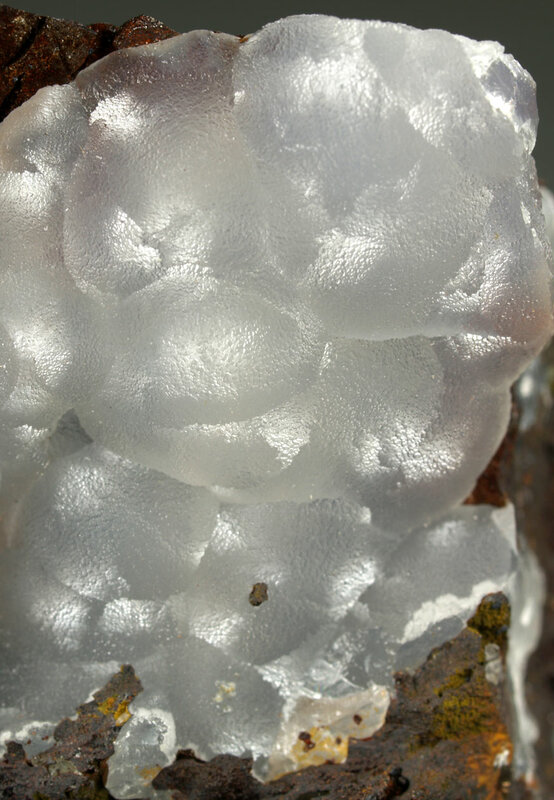 Serpierite crystals are covering the limonitic matrix. 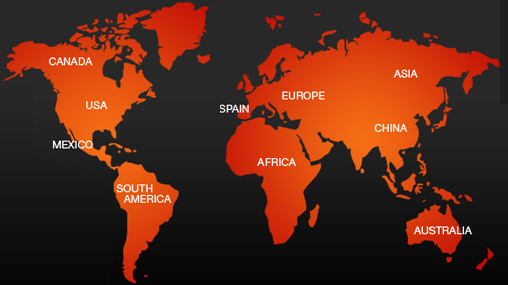 Their quality is really good very visible under magnifying glass. 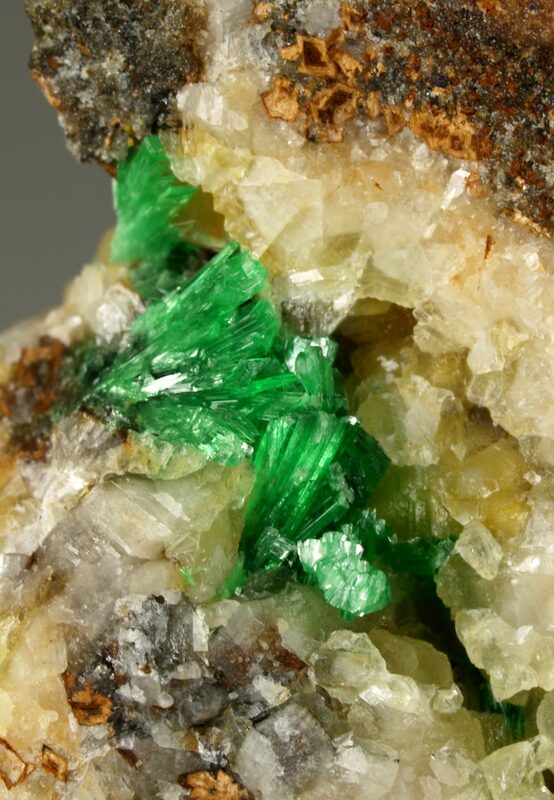 Accompanied by spherical aggregates of malachite and some crusts of azurite. 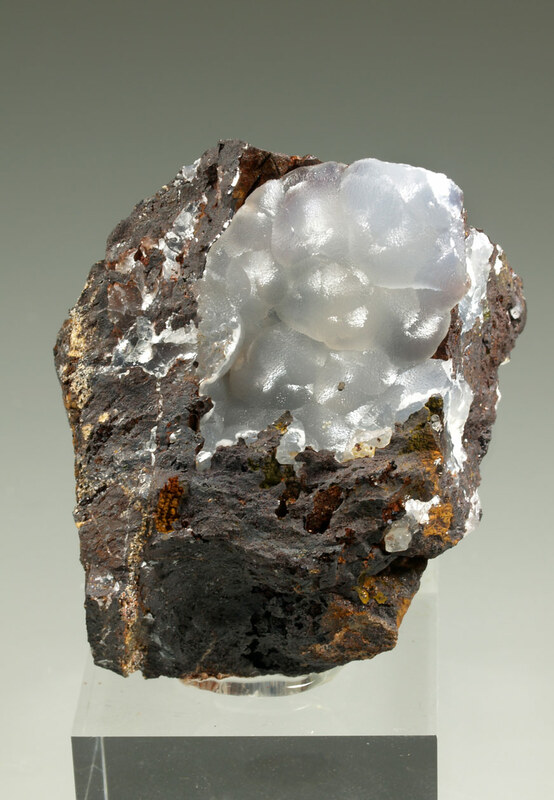 A specimen with good size and quality for the species. Size: 7.0 x 5.3 x 4.0 cm. 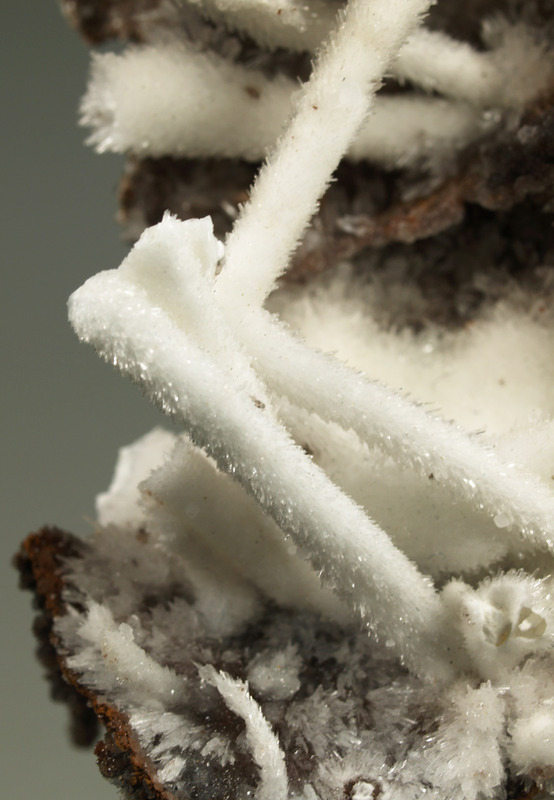 Main crystal: 1.4 x 1 mm. 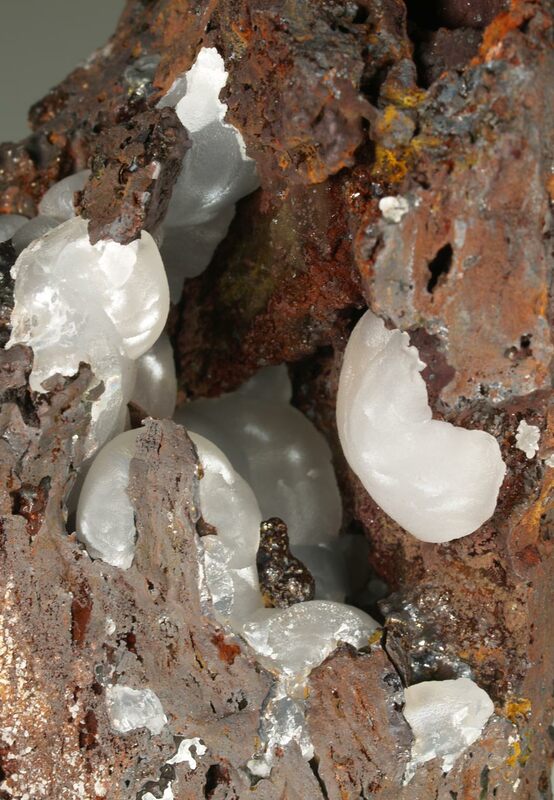 A brilliant group of botryoidal smithsonite aggregates. 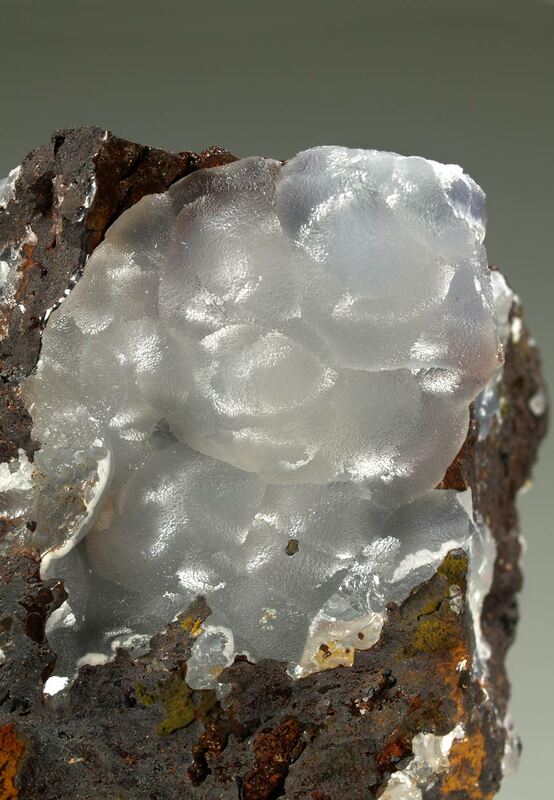 Translucent, pearly luster, white to colorless. 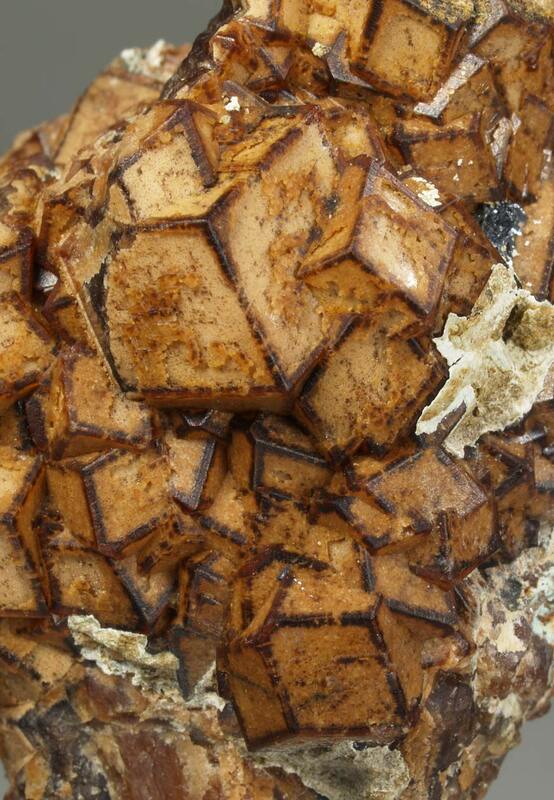 On a goethite matrix. Classic locality. Size: 5.4 x 4.5 x 3.5 cm. Size: 8.5 x 5.5 x 5.0 cm. 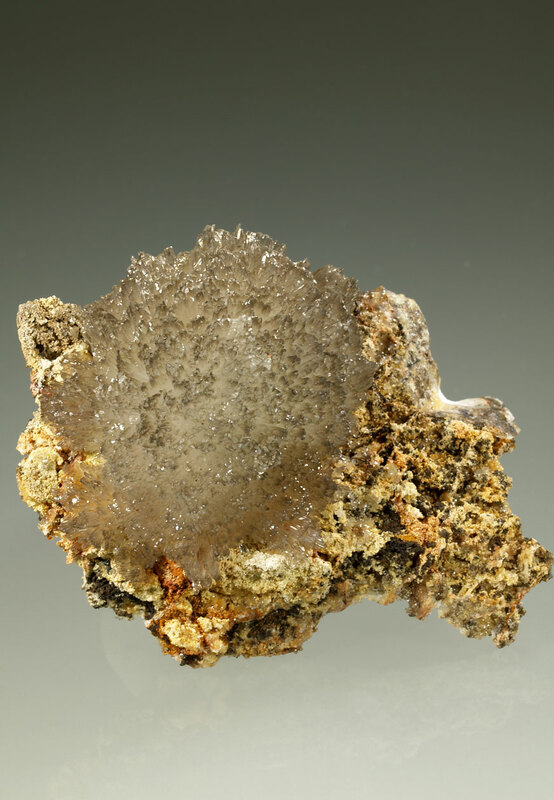 Main crystal: 17 x 15 mm glob. 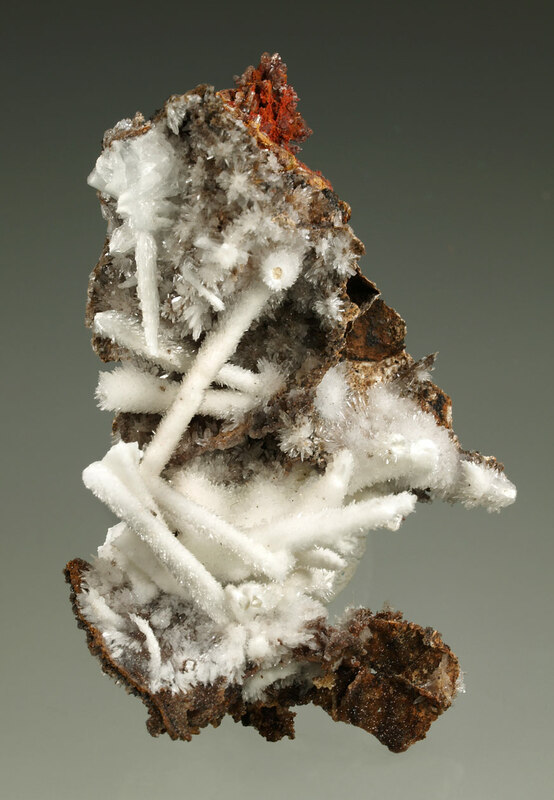 A very aesthetic specimen formed by estalactitic calcite aggregates (called cat's tail) of several acute crystals. 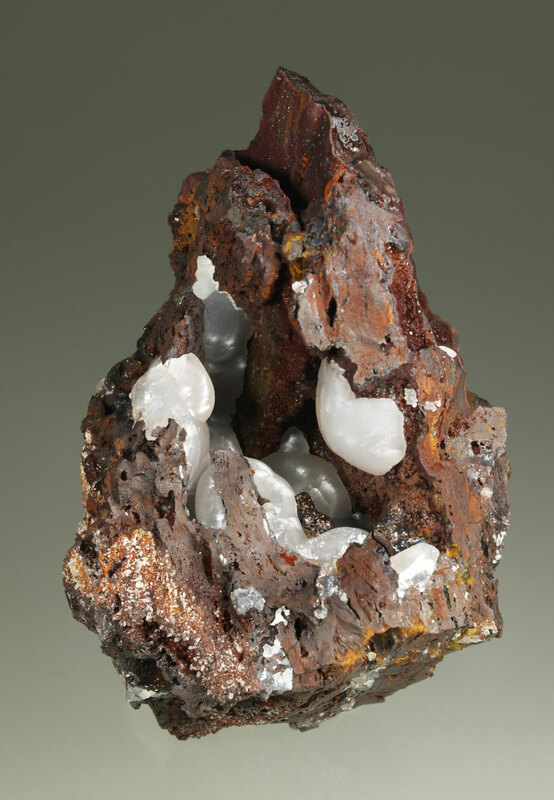 Showing a snowy white color, brilliant and disposed on a goethite matrix. 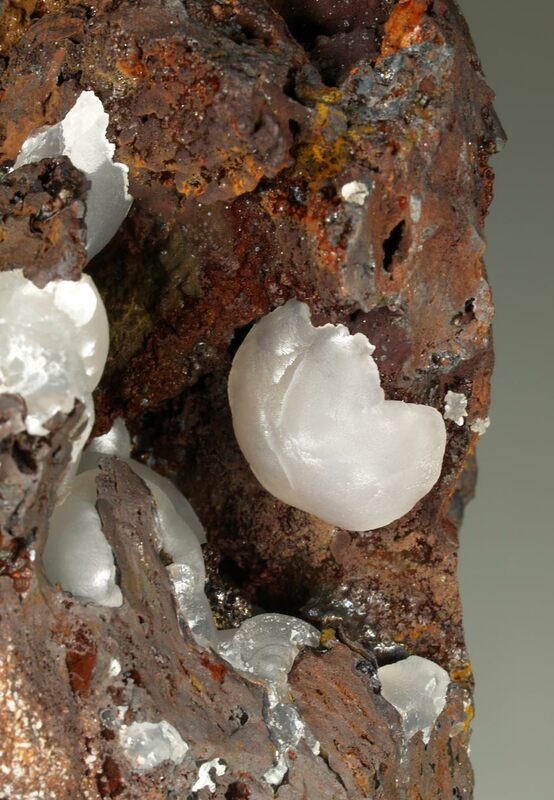 It is accompanied by small crystals of rhombohedral opaline calcite. 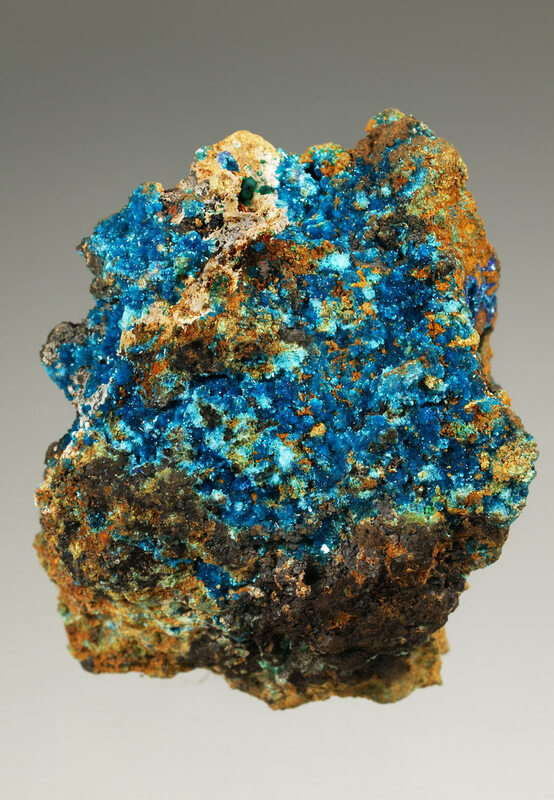 Size: 7.7 x 5.0 x 4.2 cm. 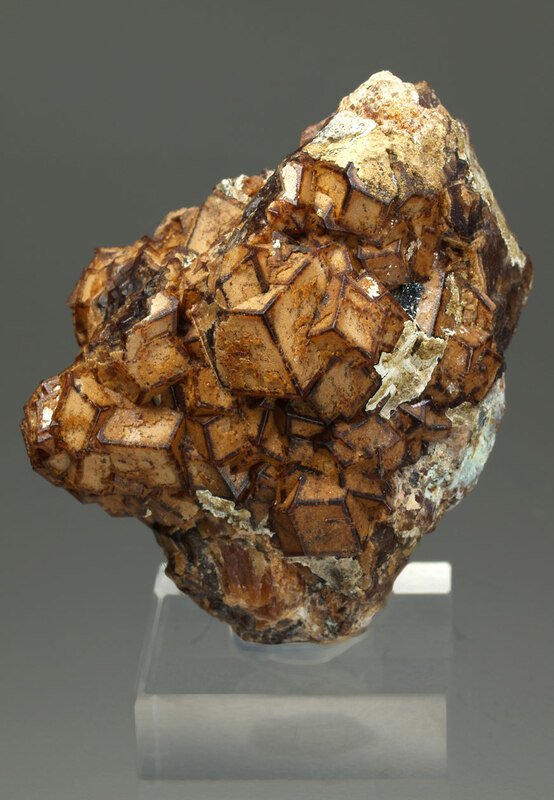 Rich group of andradite crystals showing trapezohedron forms, with the curiosity that the edges are marked with a brown line tone, and with orange faces. Showing some translucency on edges. 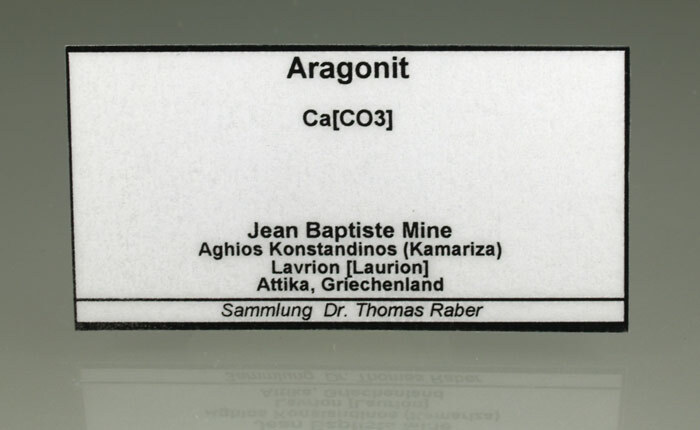 A specimen rather than representative for this classic Greek mining area. Size: 5,4 x 5,0 x 3,5 cm. 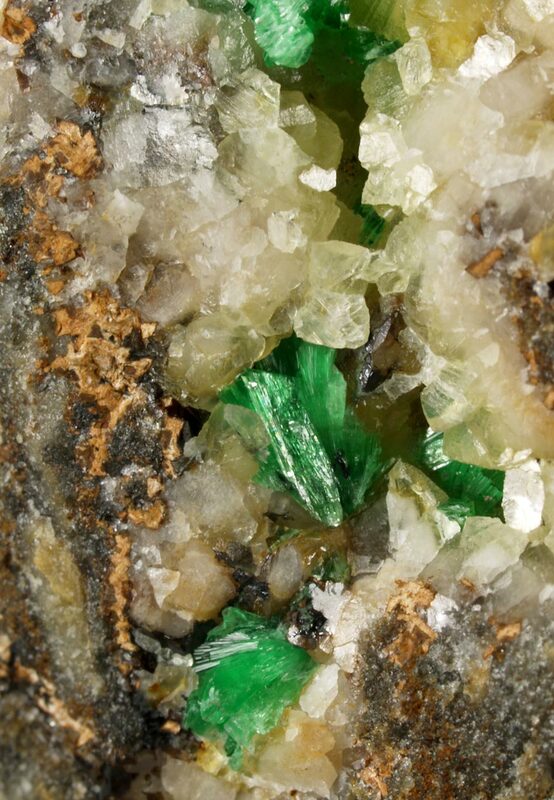 Main crystal: 12 x 10 mm.